Hot Zoomer is Joomla module from Hot Joomla Templates that makes slide show of selected images using famous Ken Burns effect that allows to zoom in and zoom out details of each image. As in any other slide show module, we have duration of each slide set in parameters. However, during that time, image is not displayed statically on the screen. Instead, it zooms in or zooms out all the time. In module parameters, you can graphically select which part of image will be shown on start and which part of image will be shown on end. 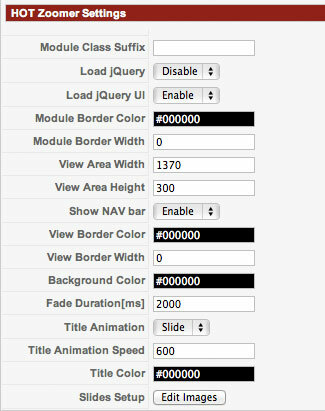 Therefore, setup of this effect is extremely easy because it's done through user-friendly module backend (see illustration). 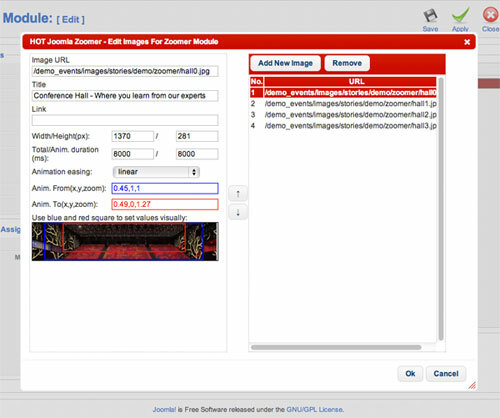 When you click Edit Images button in Module Parameters, a new window will be opened. The most important settings of the module are there. First, you click the Add New Image button and enter path of the image. If it's correct, script will read the image and it will be shown in the bottom. Over the image, you can see two squares. The blue square is starting position. The red square is ending position. You "draw" blue and red squares over the image using your mouse. In our sample, starting position includes entire image and then zooms in a detail of the image until it reaches the ending point. After that, with fade effect, new image is displayed and it can have totally different starting and ending positions.